← Pillars of the Sky (Learning from the Polynesians). In the two previous posts of this series, we focussed on astro navigation aspects of the ancient voyaging techniques of the Polynesians and the Micronesians. Because of that narrow focus, we did not do justice to the abounding knowledge and skills of these amazing navigators. Now, we will try to redress the balance by retelling, in more detail, the story of the voyage from Palmyra Atoll to Hawaii which was outlined in the post ‘Pillars of the Sky’. For the sake of simplicity, in telling this story, we will use the nautical and geographical terminology used today instead of struggling to find the equivalent ancient Polynesian terms. It is the year 1400 and Alaka’i, an experienced and highly respected Hawaiian navigator is sailing Manu, a Polynesian voyaging canoe, home to Hawaii after a visit to Tahiti, the ancient homeland of his people. The distance from Tahiti to Hawaii is over 2000 nautical miles so, along the way, Alaka’i has used several small islands and atolls as ‘waypoints’ to rest the crew and to replenish their supplies of food and water. The atoll that we now know as Palmyra Atoll is about two thirds of the way from Tahiti to Hawaii and is the last of these waypoints. Alaka’i uses the time at the atoll to prepare for the last leg of the journey to Hawaii. He has no compass, no chart and none of the hydrographical paraphernalia that we have today. However, he does have his own home-made ‘star compass’ and in his mind, he has a plan of mathematical perfection involving hundreds of complex calculations, intuitively made without formal mathematical training or any form of mathematical notation. He unconsciously uses these calculations to constantly visualize the position of his craft and in this way, he practices ‘dead reckoning’ in his head instead of on a chart. His calculations involve many factors including speeds; distances; wind and leeway; current set and drift; points of sail; courses and headings; wave patterns and shapes; swells and swell deflections and the directions of the Sun and stars. He is able to recognise many stars along with their parent constellations and he knows the ‘on top’ stars for the major islands. The star compass shows the rising and setting points of important stars and this enables him to choose appropriate ‘steering stars’ to suit his course. The star compass also shows the rising and setting points of the Sun at the equinoxes and the solstices. It is shortly before the Summer Solstice and Alaka’i knows that the Sun will be to the north of Hawaii at this time of the year. Alaka’i selects a prominent position on the atoll and from this position, at midday when the Sun is at its zenith, he scratches a line on a rock pointing towards it to indicate the direction of North. When the Sun is very high in the sky, as it is at noon, it is very difficult to judge its direction but Alaka’i has a method to overcome this problem. He takes a piece of semi-transparent cloth which is stretched over a bamboo frame; he uses this as a filter to enable him to look at the Sun and point a finger towards it. He then lowers his hand to indicate the Sun’s direction on the horizon. At sunrise and sunset, he makes further scratches on the rock to indicate the rising and setting points of the Sun. When this is done, he places the star compass on the rock and aligns the mark for Polaris to the scratch mark showing the direction of the midday Sun. He notices that the scratch marks for the rising and setting points of the Sun coincide roughly with the rising and setting points of Altair on the star compass and he will use this knowledge to help to orientate the canoe to its course during the voyage. 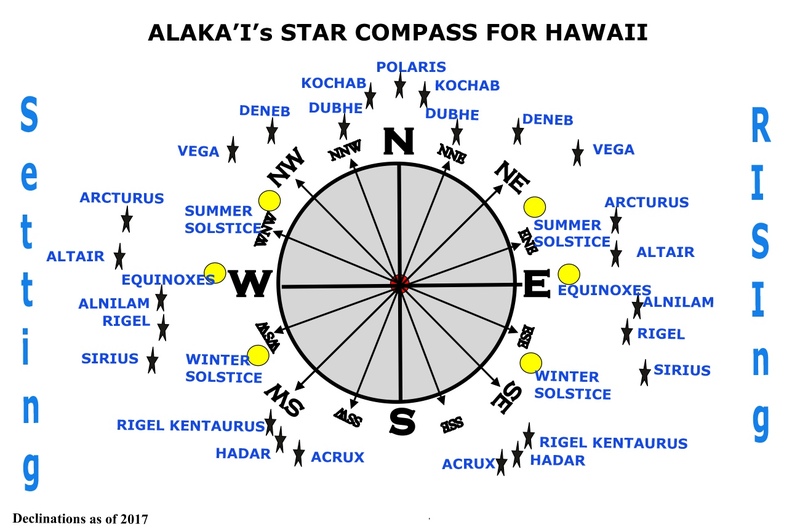 Arcturus is the ‘Star on Top’ for Hawaii and Alaka’i knows, that when he sees the star is immediately above him at its zenith, he will be on the same latitude as the island but he won’t know whether he is to the east or the west of it. If he were to be in that situation, he could easily sail off in the wrong direction and then have to spend days or possibly weeks sailing back and forth until he found land or else become hopelessly lost. His solution to this problem is to deliberately steer to one side of the island so that he will know in which direction to turn. He knows that, in the Summer, the direction of the winds in the region of Hawaii fluctuate between NE and ENE for 90% of the time and that the current sets in the same direction. If he deliberately steers to the west of the island, he will face the laborious task of beating against the wind to reach land. He decides therefore, to aim for a point to the east of Hawaii which will enable him to sail downwind and so make a ‘windward landfall’, a technique that was described in the post ‘Pillars of the Sky’. Hawaii lies roughly 870 nautical miles away in a direction between Polaris and the rising point of the star Kochab (approximately 008o). However, because he aims to be upwind of Hawaii, he plans to make for a point 100 miles further to the east. He calculates the course to this imaginary point to be in the direction midway between Kochab and Dubhe (roughly 015o) and he makes a further scratch on the rock to mark this. The final task in Alaka’i’s preparations is to set up transit marks to help him to orientate the canoe to the planned course when he sails from Palmyra. He instructs crewmen to cut two tall poles and directs them to stand them in the ground in line with the scratch mark that indicates the course. Alaka’i sails Manu from Palmyra in an ENE breeze using the transit poles to set the canoe on course. He watches the transit poles closely to help him to gauge the set and drift of the current which he judges to be setting East at about half a knot. He observes that the waves are steeper and taller than could be accounted for by the wind speed and this confirms for him that the current is setting in the opposite direction to the wind. By observing the wake and bow-wave he estimates that the speed through the water is approximately 4 knots. He also observes the angle between the wake and the fore and aft line of the boat to estimate that the leeway caused by the wind is approximately 5 degrees. Alaka’i is aware that swells, created by distant winds, may travel in a completely different direction to waves that are driven by local winds and that they do not change direction frequently in the way that local winds and waves do. He notes that the swell is coming from just abaft the port beam so he instructs the helmsman to maintain this orientation in order to keep the canoe on the correct heading. He does not orientate the canoe by the local wind and waves because he knows that these can change direction quickly. At midday, he is pleased to see that, when the Sun is at its zenith, its direction is about 10o on the Port bow which tells him that the helmsman is keeping the canoe on the correct heading of 010o. Alaka’i consults the star compass to devise a plan to keep Manu orientated to the correct course by day and by night. He calculates that the Sun should be about 20o ahead of the starboard beam at sunrise; 10o on the port bow at midday and on the port beam at sunset. During darkness, Polaris should be about 10o on the port bow; the rising point of Dubhe should be about 15o on the starboard bow and its setting point 35o on the port bow. Altair should rise about 10o ahead of the starboard beam and set abeam to port. Acrux will rise on the starboard quarter and will slowly lead the Southern Cross westward over the southern sky and then set again on the port quarter. Kingman Reef is a hazardous, partly submerged reef which lies 36 nautical miles northwest from Palmyra Atoll. Alaka’i is confident that his course will take him well clear of the reef but even so, he is constantly on the alert for signs to warn him of the danger. Kingman reef does not host land based birds and it is too low to produce the cloud effects referred to in Pillars of the Sky but Alaka’i has another trick up his sleeve for detecting land that may be over the horizon. Sometimes a swell may not be visibly detected but the Polynesian voyagers developed techniques for sensing weak swells, often by lying in the bottom of the boat and feeling for faint variations in its movement. Because they are no longer driven by the winds that created them, swells are easily deflected by land and if these deflected swells can be detected, they may indicate, to a skilled Polynesian navigator, that land is nearby. Alaka’i uses this ability to sense deflected swells to ensure that he does not sail too close to Kingman Reef. By nightfall, Manu is well clear of Kingman Reef and Alaka’i is able to relax. Before lying down to get some well earned sleep, he instructs the helmsman to hold the course by keeping the canoe on a close reach on the starboard tack with Polaris about 10o on the port bow. He does not sleep for long because, as well as checking the bearings of Kochab, Dubhe, Altair and Acrux when they rise and set, he needs to begin to observe the star Arcturus at its zenith so that he will know when he has reached the latitude of Hawaii. (Arcturus is the ‘star on top’ for Hawaii). Alaka’i knows that, at about 200 miles north of Palmyra atoll, the set of the current will change from easterly to westerly as Manu leaves the ocean current that we know as the Equatorial Counter Current and enters the North Equatorial Current. As expected, during the morning of the third day out from Palmyra Atoll, Alaka’i notices turbulence in the water and confused wave shapes and patterns from which he deduces that he has entered the region between the two currents. Towards the end of the morning, the current is setting westwards with a drift that Alaka’i knows from experience, will be about half a knot. 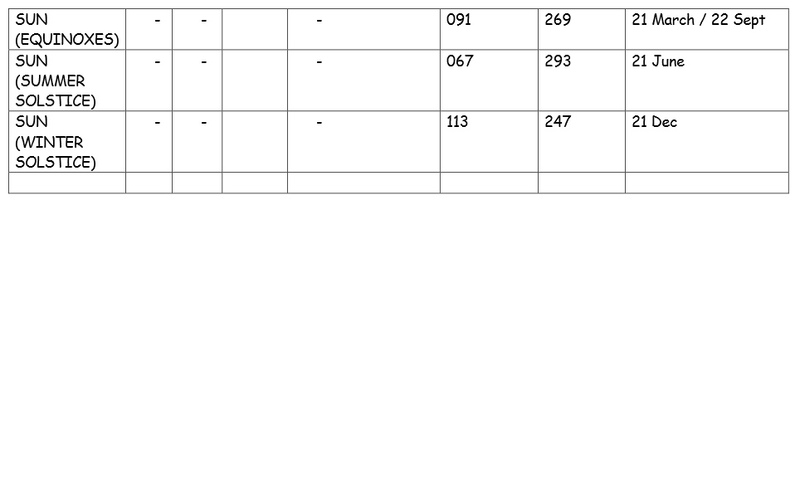 The wind is ENE (about 070o) but its speed has increased to about 15 knots causing a leeway angle of roughly 10o. Alaka’i takes these new factors into account and in an effort to keep to the planned course, he calculates that the course to steer should be towards the rising point of Dubhe (025o). In an effort to keep to the new course to steer, he sails the canoe as close to the wind as possible so that it is now close-hauled on the starboard tack. At midday, Alaka’i is relieved to see that the Sun is about 25o on the port bow and this tells him that Manu is sailing in the direction of Duhbe’s rising point and so he is confident that the helmsman is keeping the canoe on the correct heading. During the night of the ninth day of the voyage, Alaka’i observes that Arcturus is immediately above him at its zenith; this tells him that he has reached the latitude of Hawaii and so he alters course to the west in order to make a ‘windward landfall’. However, he knows that Hawaii Big Island is the southernmost of the Hawaiian islands and he doesn’t want to risk missing it altogether by steering too far south. With this in mind, he adjusts the heading to WNW so that, with Maui and the other Hawaiian islands strung out in a line to the northwest, he will have a block of islands to aim for. He orientates the canoe by keeping the North Star just before the starboard beam in order to maintain his WNW course during the night. He knows that Arcturus will set right ahead on this course which is convenient because he can use it as the ‘steering star’ as well as the ‘on top star’. With the wind from the NE, he puts the canoe on a broad reach, sailing on the starboard tack. With the wind and current helping them, he calculates that Manu is making about 8 knots over the ground and he hopes to sight land before the end of the next day. At dawn on the tenth day, Alaka’i observes that the Sun is on the starboard quarter when it rises at EbN and this tells him that Manu is on course. At noon, one of the crewmen excitedly points to a number of boobies and frigate birds hovering over a shoal of fish. This is encouraging news for Alaka’i because he knows that the maximum range of these birds from land is around 50 to 60 miles. At about this time, long white clouds can be seen just above the horizon. Alaka’i believes that these are the cloud-trails which appear during the day as the heat of the land forces moist sea air up over Hawaii and Maui’s high volcanoes. From experience, he knows that, in good visibility, the cloud-trails can be seen over 50 miles away and he is now certain that land is over the horizon. Towards late afternoon, large numbers of birds can be seen including noddies and white terns which are normally found within 20 miles of land. He can now make out the silhouette of the volcanoes against the Sun which is beginning to set. The distance to the horizon from a voyaging canoe is around 10 miles and because he cannot yet see the land beneath the volcanoes, he judges that the shore-line is about 20 miles distant. He is wary of approaching a lee shore in darkness so at dusk, he decides to heave-to for the night. With the current and the wind as they are, he estimates that the canoe will drift towards the islands at about one knot at the most and that it will not reach land before dawn. When Arcturus reaches its zenith during the night, Alaka’i observes that it is still immediately overhead and this tells him that the canoe is keeping to the latitude of Hawaii. As day breaks on the eleventh day, there is great excitement amongst the crew as the shoreline of Hawaii can now be seen about 6 miles ahead. Alaka’i steers Manu towards Waiakea Bay on Hawaii Big Island, navigates her through a small channel in the reef and heads for his home village of Waiakea. 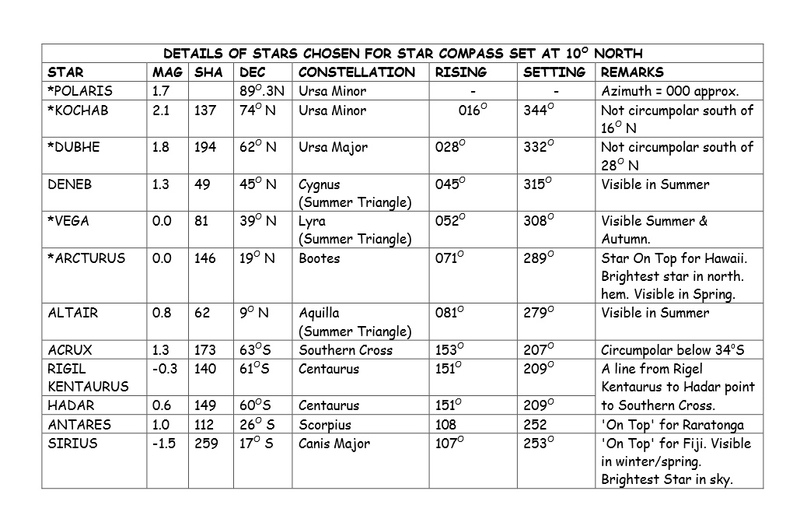 Data used for the construction of the star compass are listed below. This entry was posted in astro navigation, celestial navigation, geography, navigation, Polynesian Navigators, Survival and tagged astro navigation, celestial navigation, navigation, Polynesian Navigators, survival. Bookmark the permalink.